Had an interesting case this week. An American Yeshivah bochur learning in Melbourne brought me his tefillin to check. I saw that the yudim looked a little dubious - lacking a guf. In some cases it was worse than others - see pic below. I told him that many of the yudin (without guf) are problematic. Then he told me that he had it checked last year, in Canada, by a sofer who told him the same thing. As it turns out the sofer in Canada is a member of this forum. So I gave the customer the deatails of the sofer to find out what he paskened. It turned out the sofer asked a few poskim in Israel and came to the conclusion that the yudim were kosher. I felt that it may be a worthwhile exercise to fix the yudin, at least the worst ones, since based on the psak the Canadian sofer received, there would not be a shaila of lo kesidran - so why not try and improve the situation. This guy is a very serious bochur and wants his tefillin to be betachlis hahidur. 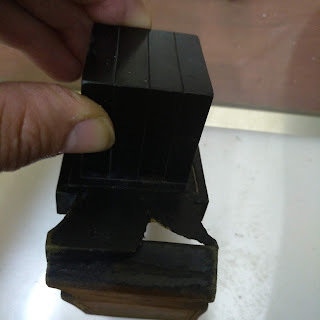 Even after tikun, will the tefillin be 100% totally mehudar? There are many reasons for a baal magia to fix STa"M.
1)REPAIRING STa"M - A shaila that was ruled kosher by tinok or by rav, reason to correct that the next magia should not get stuck. 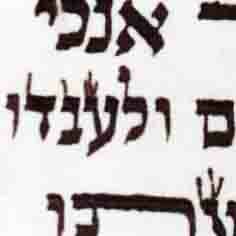 2)REPAIRING STa"M - A letter that is posul and correcting is allowed, as a square ך or missing a kutzo shel yud. 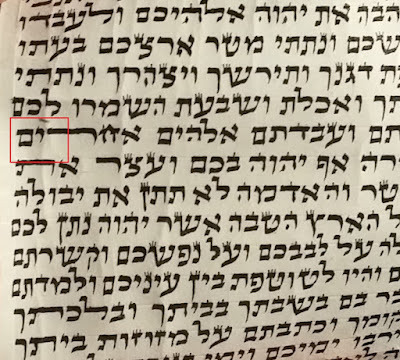 3)UPGRADING STa"M - sofer missed a tag or kotz that makes it missing hidur or any other imperfection in letter. I believe Rabbi Gutnicks shaila goes into category 3 which is upgrading STa"M.
if the sofer missed only a few tagai lamed or a few ך are not kiflayim or a yud as in this post -it should be fixed by the baal magia. 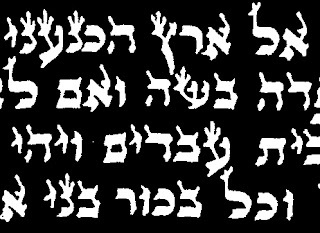 If the entire tefilin was written in this manner, the baal magia should not upgrade it. #1 The possibility of making the tefilin posul is very great. #3 in this case who says that after all this work the tefilin will be a higher grade of hidur if its kosher its kosher as is, and according to any machmirim fixing might not be allowed so what have we gained. My policy is always to fix before upgrading.